You give up enough when you're vegetarian but you shouldn't have to deny yourself one of life's greatest culinary pleasures: game day snacks. 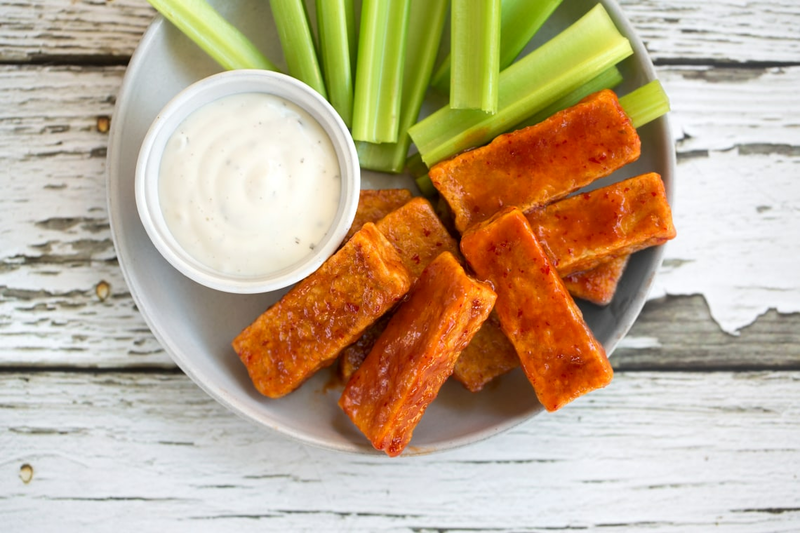 This vegan recipe for Buffalo wings evokes the classic flavors of the bar menu staple with tofu standing in for the chicken. The tofu is cut into planks, breaded, and fried until delectably crispy. It's then coated in a spicy and tangy Buffalo-style sauce. The result is an addictive finger food that tastes a lot like the classic appetizer—especially when you dip it into vegan ranch sauce. Freeze the block of tofu for 24 hours and thaw before using. The ice crystals compact the soy curds; when they melt, helping extrude water. The end result is a chewier tofu that’s ready to take on all the good flavors of the Buffalo sauce. Per Serving: 405 calories; 35g fat; 18.5g carbohydrates; 5g protein; 15mg cholesterol; 1387mg sodium. 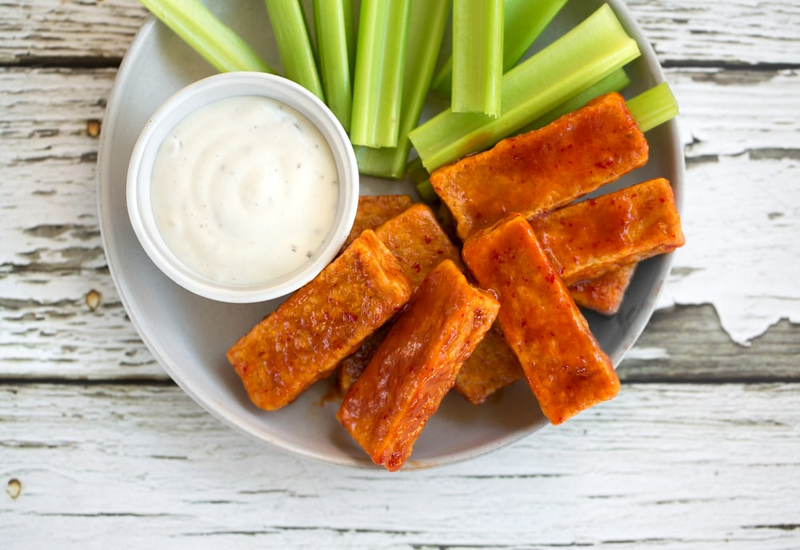 These buffalo tofu sticks were perfect for my Super Bowl party. The breading made them nice and crunchy. I didn't have time to freeze the tofu in advance, but next time I will try that method. 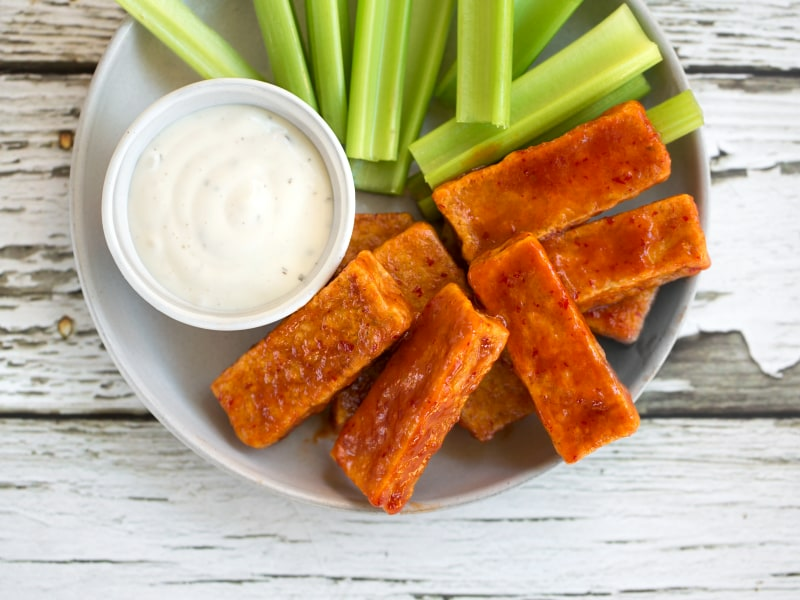 Yummy, crunch buffalo tofu sticks, perfect for game day! I was getting tired of the buffalo cauliflower wings, so this was a nice switch for a vegan-friendly appetizer. Full honesty, I'm not a huge tofu fan but I have been trying to eat more protein so I tried this out. The buffalo sauce really hid the fact it was tofu, and I enjoyed this appetizer a whole lot more than I expected. It was a big hit at my dinner party. You had me at fried tofu. So delicious! I used regular flour and they fried perfectly. I tried this and instead of ranch we paired this with a vegan blue cheese recipe and a nice tall beer. It was really good.